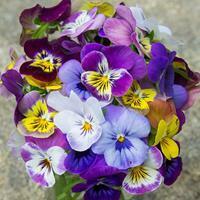 This heirloom hails from 1947 and won awards for its sweet and flavorful wavy edged leaves. A looseleaf type with heat tolerance making it slow to bolt, it is perfect full grown for salads and as a “cut and come again” baby leaf salad ingredient. Delicious in salads, added to sandwiches, or used as wraps for delicate finger foods. Classic and non-bitter 'Buttercrunch' has a rich yet mild flavor with a buttery, almost velvety texture. 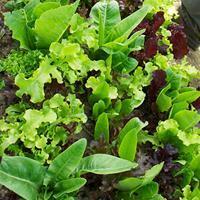 Kitchen gardens cannot be without this mix, for its variety is a perfect base in salads. Also adds color and flavor to everyday sandwiches. Keep a pot of it outside the kitchen door for easy access, as its sure to be in demand! This mix contains Baby Oakleaf, Bronze Beauty, Buttercrunch, Crisp Mint, Freckles, Ice Queen, Grandpa Admire's, Pablo, Outredgeous, Black Seeded Simpson, Speckled and Tennis Ball. Glossy deep maroon ruffled leaves are high in health-giving anthocyanins, and make a colorful addition to spring salads. 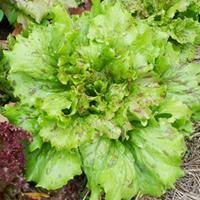 An amazingly beautiful lettuce that is also disease resistant and delicious in cool weather. Allow to bolt at will, the tower of maroon leaves will star in your mixed garden of flowers and veggies! A carefully selected collection of romaine varieties-Outredgeous, Plato, Olga, Really Red Deer Tongue, and Flashy Romainesque make for a brilliant, varied and great tasting mix. 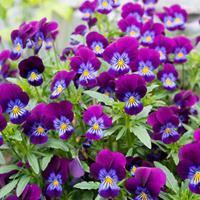 Cut baby leaves or thin as you harvest small plants, either way this collection is a winner. An heirloom lettuce grown by Jefferson at Monticello and by countless more gardeners seeking superior flavor. It is one of our favorites for its beauty and delicious buttery flavor. Tender spring green leaves are arranged in loose whorls, each 6-7” head creating an individual sized salad. Best for spring fresh eating or fall crops as it dislikes the heat of summer. 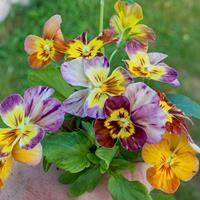 Selected from a collection of historic violas, chosen for their decorative and edible petals streaked with contrasting or complementary colors. A good choice for cool weather, spring in the North, winter in the South. Best in organic, moist, well-drained soils, they should be trimmed when they get leggy to revitalize. There are just some flowers that always make you smile--this is one. Happy little faces in lovely shades of purple and lilac blue, with penciled 'whiskers' and bright yellow eyes bloom spring, and due to their heat tolerant nature- all summer and fall in moderate areas.